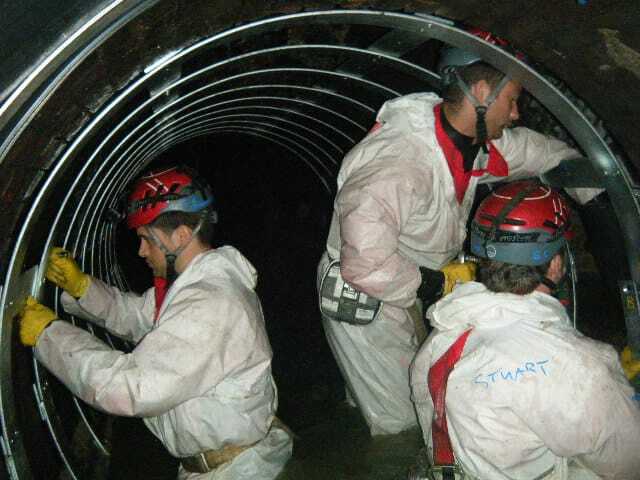 A 1.9m diameter sewer, 17m below Oxford Street at risk. As part of the £500m Tottenham Court Road Station Upgrade, future tunnelling works underneath Oxford Street required consideration of potential risks to adjacent sewers. To mitigate the risks identified, 100 metres of the Mid-Level One, a 1.9m diameter brick-built sewer, required protection. A lining system was needed that could maintain the structural and hydraulic integrity of the sewer, prevent any water egress into the tunnel under construction beneath and be installed in significant live flows. UKDN Waterflow created the solution in the form of In-Flow Liner, designed with 100% reusable materials. The system uses a series of reinforced rubber sleeves (each of 6 or 10m length in this case), which are overlapped to form one continuous, watertight liner within the existing pipe. The custom made rubber sleeves are secured and held into place against the host pipe using a series of expandable stainless steel bands. 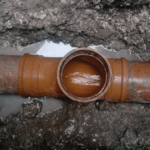 In-Flow Liner can be installed in up to 750mm of flow in any man-entry sewer and a range of shapes and diameters as a permanent or temporary solution.